Since this site was last updated in 2002 life has been bittersweet for Bobby. On the sad side Bobby's wife, Nettie Mae, died some years ago from a serious illness and some time later his mother, who he was very close to and visited regularly, died aged 98. After Nettie Mae's death Bobby's health was not good but after some time he had two knee replacements which have been a great success. On the bright side a few years ago Bobby met a lady, called Jane who was a widow, and this has resulted in a very happy marriage. They love to travel and go on long train journeys all over the States and they also use a camper van in which they holiday regularly. Musically Bobby does not play any more but two events should be of interest to Gene Vincent fans. 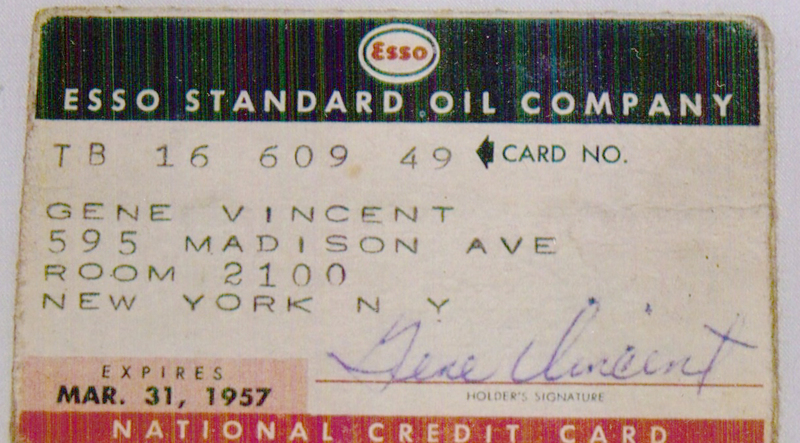 An original credit card which belong to Gene and was signed by him. 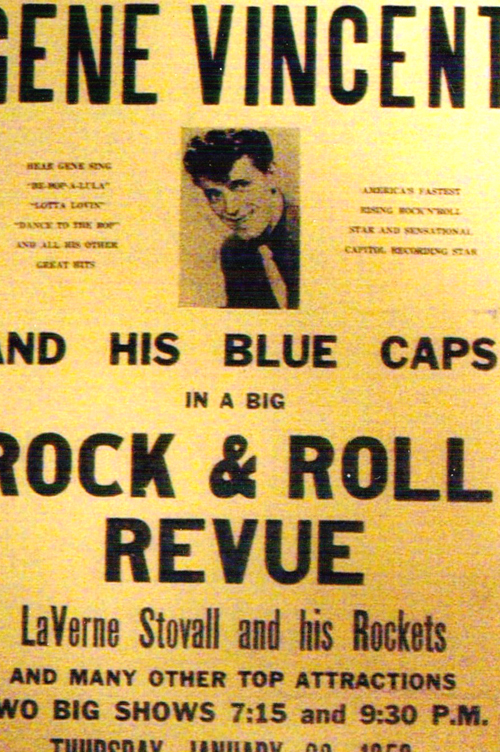 An original poster of a Show. 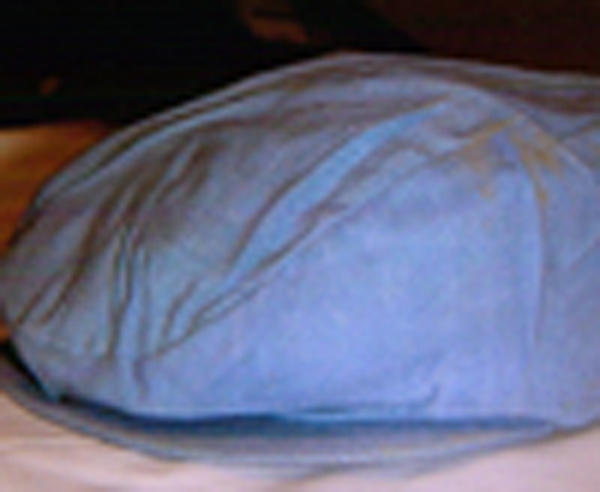 An original 50's blue cap. 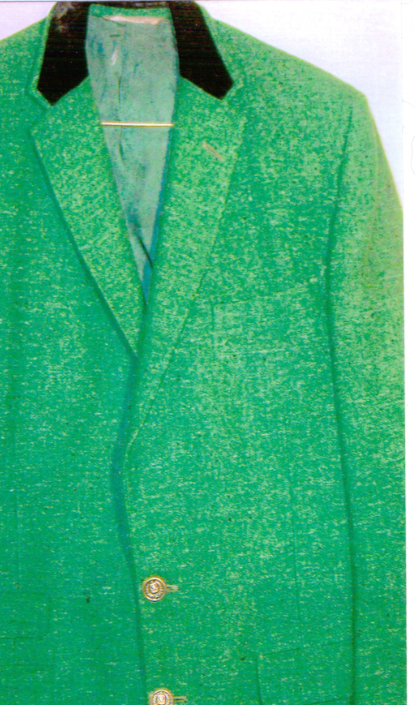 A Blue Cap stage jacket worn by Bobby. 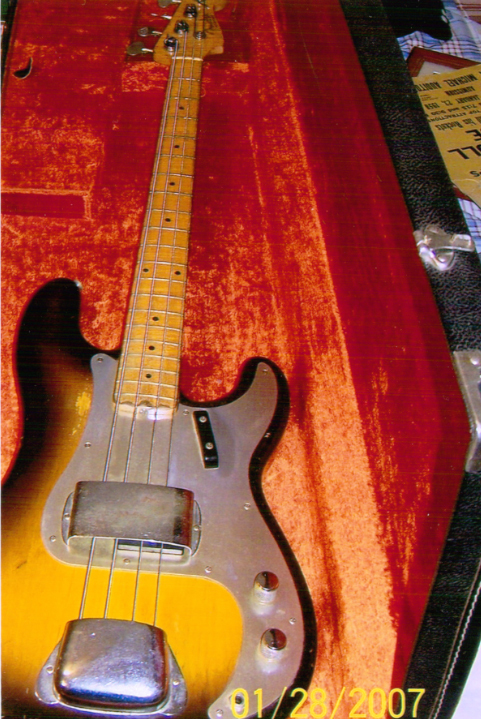 Bobby's original early Fender Bass Guitar - Sunburst model. The above items are not yet on display, at The Rock and Roll Hall of Fame, but they should be on display very soon. Secondly:- In 2009 Bruce Springstein issued an album called 'Walking On ADream'. There was a deluxe addition of the CD with an accompanying DVD - on the extras there is a song called 'A Night With The Jersey Devil' (not on the CD) which is a rewrite of 'Baby Blue' and Bruce sings the first verse of this song at the end of 'A Night With The Jersey Devil'. This, as I have said, is available on the deluxe version only. It had been issued previously on a 7 inch vinyl single in the States, which was a limited edition. The song and video can be found on the Internet, also details about the song. Bruce Springstein's legal team ensure royalties were paid properly to all parties. I keep Bobby updated if there is anything new about Gene and The Blue Caps. Bobby sees Johnny Meeks and Country Earl quite often and speaks to Dickie Harrell by phone. Now for a little bit of trivia - foremost collector of Gene Vincent material, Wolfgang Hetzel from Germany, undertook a project for Bobby to see how many versions of 'Baby Blue' he could locate including Gene's and cover versions of the song. Presently he has located 95 audio recordings and 58 videos! This is truly amazing for this wonderful song and I know he has located even more versions which he still has to advise me of. He has also investigated the number of versions of 'Say Mama' for Johnny Meeks and Country Earl, but that is another story and it is unbelievable the figures for that song. Bobby is now in his late 70's and he remains very active, restoring his collection of vintage cars and doing joinery work. He never forgets his time as a Blue Cap and those wonderful days over 50 years ago when Gene as at his peak. Well Hello, everyone ... I just wanted to say Hi, I'm Latrice, I'm Bobby Jones niece ... I think it's sooooooo great that there are folks that still like "rock" music ... instead of what's out there now ... 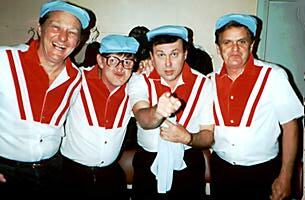 I don't know what to say really, but I'm interested in hearing memories you guys may have about "Gene and the Blue Caps" ... Uncle Bobby, had stopped playing by the time, I got old enough to be born! hehe. He's so different than the "teen" band member, I've been hearing about, he's sooo layed back, got a simple life (heck he didn't have a CD player until last year), doesn't own and probably never will own a computer, loves gardening and animals ... has lots of Stray Cats (ha-ha) around his property, that he takes in feeds, cares for and even gets medical help if needed, and he does this faithfully ... feeding takes him a hour or so alone, and he does this 2-3 times/day. He's still married to Nettie Mae, they've been married, since forever ... no kids together, my cousin, my brother and myself are there kids, weÝstayed with them ALOT, well until our parents wanted to see us, ha-ha,Ýshe's got Cancer and putting up a hard fight right now ... but he's there and taking care of her ... it's sooo hard for him to watch her ... he'd just retired, sold their business, and were gonna look forward to doing some travels ... that's the way it goes huh? Well if there's anything I can help or try to ansewer, I will ... Thanks again, for allowing me to post. Ask any Gene Vincent fan to list his top 5 Vincent recordings and it's odds-on that "Baby Blue" would feature very near, if not at, the top. It's a Vincent classic - a perfect example of Gene and The Blue Caps in total unison full of power and aggression, of tension and climax - a terrific number! Watching Gene and the Blue Caps in 'Hot Rod Gang' you can't fail to be gripped by the performance. The song was obviously just as much a favourite of Gene as it was with his fans as it became a near permanent feature of his stage act throughout the '60's whenever Gene was in Britain. Add to this the fact that the Song has been performed and recorded by countless other rock 'n' rollers from Vince Taylor to Shakin' Stevens and you have a fitting tribute to the quality of the song and to it's co-writer, Bobby Lee Jones. Bobby looks on pensively as Gene and the Blue Caps strut their stuff. Gene and Bobby wrote 'Baby Blue' together on tour in 1957 Gene wrote the middle verse. 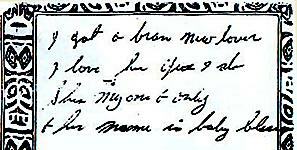 Above is a copy of the words of the first verse, just as they were written by Bobby on a scrap of paper over 41 years ago. Bobby Jonas is a South Carolina man and has remained so throughout his lifetime. Born in Greenville on January 4th 1934, Bobby has never left the state for any length of time except for being on the road with Gene in the late '50's Bobby first took an interest in the guitar when he was about 13 years old - his early tuition coming from a friend at school. It's interesting that although Bobby took up playing bass guitar in about 1956, he never ever played the stand-up variety, unlike his predecessor, Jack Neal. 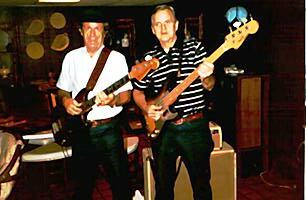 With Gene, Bobby mainly played a Fender bass but earlier he recalls using a Kay guitar and a Gibson. Like many other southern musicians in the very early '50s Bobby's first musical leanings were towards country music. While still only in his mid-teens Bobby, along with Country Earl and two other friends, formed the Blue Still Boys. They played local High School dates and had a small daily radio show. Shortly after this the Circle E Ranch Gang were formed - a group which, as many Gene Vincent fans now know, provided Gene with quite a few Blue Caps over the years! Country Earl and his Ranch Gang became a very popular group In the Greenville area and Johnny (Earl) became a big local DJ Bobby and Johnny are still friends today - Earl has a restaurant business and lives about 5 miles from Bobby. 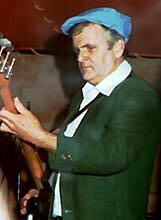 It was early in 1957 that Gene Vincent was putting his second Blue Caps together, Johnny Meeks had already joined Gene from the Circle E Ranch Gang and now Gene was looking for a permanent bass player to replace Jack Neal. So it was Johnny who recommended Bobby to Gene and after a phone call from Mr. Meeks, Bobby didn't take much persuading in becoming a Blue Cap. Interestingly enough, Bobby was already a great admirer of Gene's and earlier in the year ('57) Bobby had actually become a paid up member of the Gene Vincent Fan Club! Bobby's spell as a Blue Cap covered a tremendously hectic 14 or 15 months through the remainder of the of 1957 to the Spring of 1958. During this time he toured all over the USA, Canada and Australia; appeared in the movie "Hot Rod Gang" and played bass on 40 Gene Vincent recordings! As well as co-writing "Baby Blue," Bobby also wrote "Look What You Gone And Done To Me" which appeared on Gene's "Record Date" album. 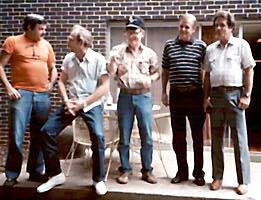 Country Earl, Johnny Meeks, Paul Peek, Bobby Jones and Bill Mack. Bill Mack and Bobby at Bobby's home in the US. TOMMY: "Bobby was the most conservative of the bunch but he had his sneaky little ways of doing things. Bobby had ways to agitate and make things start - like over in Australia. Bobby saw that Paul Peek and one of the other tenants in our hotel were having problems - making too much noise in the room above. That's all Bobby needed. Paul went back to bed, so Bobby gets up there and started - boom! Boom! Boom! on the floor above Paul - so right away, Paul thinks it's that guy again. Bobby, you've got to watch him! He's conservative but we know him! He's got his own little way of doing things!" DICKIE: One time Paul was down. Every time we played cards he was loosing. So he said "this is it, I'm gonna end it all - it's finished! Leave me alone" - and went up to his room. It was summertime and the window was open - I was sitting near it. Paul shouts down - "Boys! Boys! Don't bother me, don't mess with me - I'm ending it all!" He was gonna jump off the balcony using a sheet as a parachute! We thought he'd lost his mind! He shouts, "Here I come! Here I come! ..and then, whoooom! The sheet goes right by the window! He'd put rocks in it! Him and Bobby had got together - they got this sheet and filled it full of rocks.. We ran out there looking at this sheet and there was Paul and Bobby laughing at us!" PHOTO: The Blues Caps at Weymouth 1987 - Johnny, Paul, Tommy and Bobby). Shortly after the 'Record Date' and 'Hot Rod Gang' sessions in 1958, Bobby decided to leave Gene and the Blue Caps, opting for the more settled way of life back in South Carolina. He was never to see Gene again. It was a long time before we, in the U.K., got to hear of Bobby again. Thankfully his split with the Blue Caps wasn't the end of Bobby's musical career. In 1959 Bobby travelled south-west to Atlanta in Georgia to play bass for Paul Peek on 'Gee But I Miss That Girl/Waikiki Beach' (NRC 033) and Bobby also said that he recorded with Country Earl. 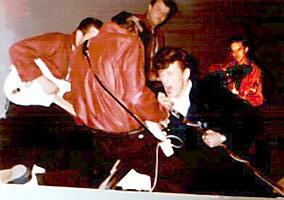 Later he played with a local band, the Versitals, for nearly 10 years from the mid-60's till about 1975. The band played all kinds of music and it's interesting to note that the group also featured Don Dudley (the Floyd Edge who wrote 'Dance To The Bop').